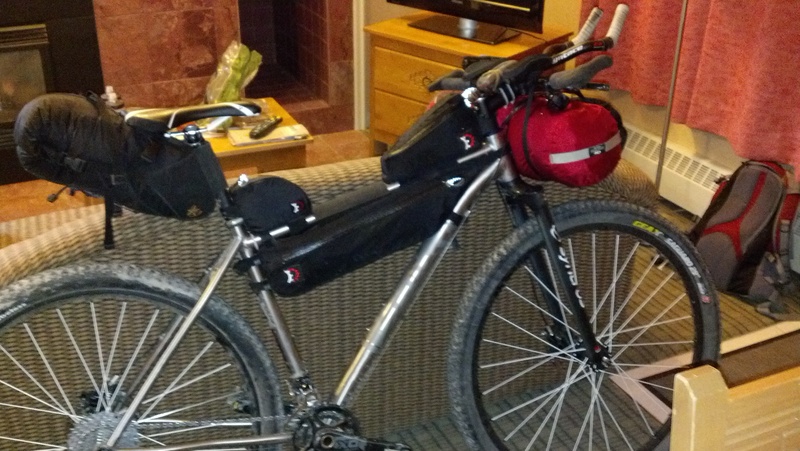 Since I have gotten back I have gotten lots of questions about my setup for the Tour Divide. So instead of individually responding I hope to answer all of your questions right here. In this write up I intend to answer some common questions and give recommendations for your gear setup and training regimen rather than just tell you what I use for my setup. I believe this will be more beneficial because what works for me does not necessarily work for you. First, I would like to begin by discussing tire choices. I believe that choosing the right tire is one of most important decisions when it comes to your bike because they get the most abuse. Whether you run tubeless or a tube setup you want to have confidence in your tires. How you make your choice will ultimately depend on what type of terrain the race consists of. When choosing a tire for the Tour Divide Race (TDR) I took into consideration 3 different qualities that we all seek for a TDR tire. This includes durability, weight, and rolling resistance. Now we all know that there is no perfect mountain bike tire out there, and getting a good balance of all three of the qualities is very difficult to near impossible. From all the time I spent reading reviews and researching tires and doing trial and error runs, I learned that you cannot have all three in one tire. It is easy to find a tire that is very durable with low rolling resistance, but forget about getting the tire under 600 grams. Once I accepted the fact that no perfect tire exists, and stopped being a weight weenie, I choose the two obvious qualities I wanted in my tire. Those were rolling resistance and durability. For me this was an easy choice, for 200-250 extra grams (~.5 lb) the durability was worth it. I wanted a tire that would last for 3000 miles, and have zero flats. Another reason why you want to have a durable tire on bike packing races is because the amount of weight on your bike. I was at 48 pounds with bike and gear plus 155 pounds for myself. With that much weight an extra pound in the tires won’t kill you, and you won’t need to worry about flats or whether your tires is going to fail. If you are worried about the weight, train harder, drink less beer and loose some weight off yourself. For the 700 miles that I did ride on the Divide I did not get one flat. The same tires are still on the bike and they currently have over 1000 miles on them with very little wear. I would highly recommend this setup. Also to note-The Saquaro TNT version is very hard to get onto the rims, but once they have been ridden on for a couple weeks the bead stretches and it is much easier to take them off by yourself. So if you choose this tire for any race make sure you put them on ahead of time so that you don’t have problems if you need to take the tire off. Enough said about tires. Lets move on to the sleeping kit. This choice of gear is a little more personal but can still be broken down into 3 qualities (Just like tires). The three that come to mind are comfort, durability or reliability (interchangeable) and weight. Of coarse all three of these come into play for each piece of the kit, which, usually consists of a sleeping bag, pad, and some sort of a shelter. I will go into the options that you have with todays hi end light weight materials and hope to break things down to simplify everything so that choosing a setup for you is strait forward. Once again, the gear choice is subjective to what race you are in, and depends on a number of variables such as the length of the race, where it is located and the time of year. For example, the Tour Divide is so long that you will go through all kind of weather that you cannot predict, so being ready for any kind of weather will be considered. On the flip side, the AZ 300 is so short that you have a better idea of the weather for your 3-5 day push and can plan according to the forecast. So now that we have established that length of the race is the most dominant variable when it comes to choosing your sleeping kit lets go into the three qualities that will mitigate the variable. #1 Your Sleeping Pad-This is the most personal choice of the sleeping kit. Some of us can skimp a little in this area. Usually the younger guys can get away with less padding, the older guys are tired of sleeping on rocks I guess, unless your name is David Goldberg! With todays high end materials it is much easier to have a very light weight setup and still have a good night sleep, but, not necessarily have the durability. Some of you may disagree on my opinion about durability, but I am speaking based on my experience with certain sleeping pads. This leads the discussion to the Neo Air Thermarest. I have seen a lot of racers using these, and there are many good reasons. These are very lightweight, take up hardly any space, and are very comfortable. Some drawbacks include the material being very noisy when you move around, provide very little insulation from the cold ground and can be easily popped if you are not conscious of where you lay down at night. My experience with the Neo Air wasn’t pleasant because the first night on the AZ 300 my mattress popped, therefore I am a little biased. It was annoying to have to blow it up 4 times a night in order to be comfy. Others have had better luck with blow up Thermarests or other air mattresses, so try them for yourself. Remember to test your gear to the max so you know it works. I recently switched to a standard foam pad. Some Pros-Lightweight, high reliability/durability and good insulation from the cold ground. Some Cons-Little bulkier and not as comfy. Once again the gear choice comes down the durability for me. With the Tour Divide being as long as it is, I wanted something that wouldn’t fail me. Once again, decide what is more important to you when choosing your sleeping pad. When I enter these long races I always consider durability the most important factor. Do you want to sacrifice some durability for a little more comfort? If so then maybe something like the Neo Air is a better choice. The Neo Air is just one of the super light sleeping pads out there. So explore your options and find one that suits you best. Enough on the sleeping pad, I could analyze this all day. Sometimes you just need to go with something and try it rather than spending tons of hours researching it. Because there are hundreds of opinions and reviews online and the only one that matters is yours when it comes to personal gear. So try not to over think things because you will drive yourself nuts. #2 Sleeping bag-This is a simpler choice IMO. Comfort and weight come into play here, durability shouldn’t be as much of an issue. My sleeping bags have always lasted me plenty of time. First thing you need to decide on is whether to buy synthetic or down. There are hundreds of articles out on the internet about the differences so I do not feel the need to discuss it here. Next criteria for the bag is the temperature rating. This will depend on the weather, how much resistance you have to the cold, and will also be a factor of weight if that is important to you. For me on the Tour Divide, I used a 55 degree bag made by Lafuma, super light. I have used the same bag for every race, I was able to stay warm when temperatures got down to 18 degrees. So this bag is useful for practically every race. Most riders will choose a warmer bag because they aren’t as resistant to the cold weather like I am. A bag in the 30-40 degree range seems to be a common choice. Also take into consideration that you will be completely thrashed when going to bed and your body may not be as efficient at keeping you warm, you will find out by testing your gear while training I hope. Try to buy a bag that will work for any race that you do, therefore you don’t have to buy 2 different bags. Do everything you can to save money, the costs really start to add up. So a quick overview…synthetic or down? Temperature rating? and make sure you get the correct length bag as well. Simple. #3 Shelter-This is a difficult one. And I could write easily write a novel on the subject but instead I will keep it short and touch on the subject just to get you thinking on your own. This is also a weather dependent choice. If you are in the Tour Divide or any long race where predicting the weather is impossible make sure that your shelter can handle anything. When it comes to my shelter I get the most waterproof material without sacrificing to much breathability. My personal choice is a bivy sack made by Black Diamond with a material called Bibler Tech. The material is highly waterproof and I never wake up with condensation inside my sack. The material inside the the sack is kind of fuzzy which attracts moisture and easily transports it outside the bag. Other bivy sacks on the market aren’t so good at getting rid of moisture and you wake up to a really wet sleeping bag. If you can afford one of the Black Diamond bivy sacks at around 250 dollars they are well worth the investment. They are lightweight, durable, breathable, no need for setup, provides some insulation, and is waterproof, but they are expensive and don’t give much room for moving around. Basically what the sleeping kit comes down to is deciding how much of each quality is most important to you. Comfort, durability/reliability, and weight all come into play. Its all about finding the perfect balance (which don’t exist but you can get pretty close), which can be a frustrating task. Do a little research, go test your gear, revise if needed and then go ride to your hearts content.